What types of bread and bread substitutes are there for people who are allergic to wheat (and also soy), as a part of breakfast fare (sandwiches etc)? Unfortunately most of store-bought bread here in Poland, be it rye bread or corn (maize) bread include quite a large amount of wheat among its ingredients. One that doesn't is Lithuanian black rye bread, but it is hard to get. Perhaps there is something that can be made at home? If you want to cast a wide net, searching for gluten-free bread might be your best here, even though is a wheat allergy rather than gluten intolerance, since removing the gluten necessarily means removing the wheat. Soy isn't too common an ingredient in breads so you should still be okay. And yes, you can make plenty of kinds of gluten-free bread at home, just search for recipes. Since gluten-free food is a big thing these days, a lot of people have put a lot of effort into figuring out recipes for gluten-free bread, so you should be able to find a variety. The tricky thing will then be finding the necessary flours. Bread normally depends quite a bit on gluten for structure, so it takes some effort to make recipes work well without it, and following them exactly is pretty important unless you're prepared for some serious trial and error. So when a recipe asks for white rice flour, brown rice flour, potato starch, tapioca starch, and powder, you want to either find those things or find a different recipe to try. I don't know a lot about names of traditional wheat-free breads that you might be able to buy as-is, unfortunately, but I'm guessing that a lot of them will have a pretty different texture from wheat bread, so you might not be as happy with them. 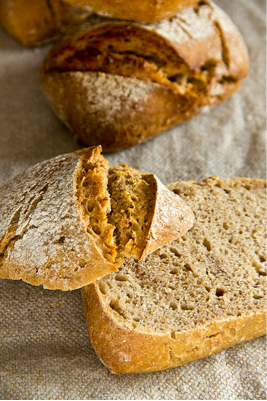 Of course, if you like Lithuanian black rye bread, you could certainly look for recipes for it or other rye-only breads. The following answer is aimed at wheat intolerance or allergy, not gluten intolerance. Sometimes the two terms are incorrectly used interchangeably, especially with some "trends" in diet. The suggestions below are not gluten-free, but wheat-free! Fluffy light sandwich breads rely on a gluten network to trap CO2 and steam and create a sponge-like structure. Unfortunately this typically means using wheat for the bread because wheat allows for the best gluten development while rye needs sourdough to inhibit the enzymes that would destroy the gluten network. Gluten-free breads try to emulate this with various substitutions, which are often but not always wheat free. So read either the label or the recipe carefully - also to make sure that there are no soy-based substitutions. The Internet is full of gluten-free recipes and ready-made flour mixes and breads are available, if not in a standard supermarket, then perhaps in healthfood stores or online. or from finely-ground rye, leavened with sourdough and sometimes additional yeast. They can be easily baked in a home kitchen, just need a bit more time because the sourdough needs more time to work than yeast-only breads. While many rye breads have some wheat mixed in, this is not always the case, so either ask your baker, read the ingredient list in the supermarket or choose a 100% rye recipe. Traditional Scandinavian crispbread was made with wholewheat rye bread, some brands use part wheat, so again: read the label or choose the right recipe. Corn tortillas, the Central and South American food staple might be difficult to buy in an European shop, but could be worth a try at home. They are also gluten-free. Almost all 'gluten free' breads lose much of their elasticity when they're cold ... in some cases, they'll crumble if you try using them for cold sandwiches, or they'll be so dry that you need lots of mayo on them. (mustard and other 'wet' condiments can cause them to break down, making things worse). If you're willing to do some cooking yourself, the easiest replacement is salvadoran corn tortillas. They're much thicker than your typical corn tortilla, and it's made with masa de harina, which is a very finely ground cornmeal (it's essentially corn flour, but beware that 'corn flour' in the UK is 'corn starch' and not what you want). You can mix up the amount that's appropriate for what you need, let it sit to hydrate, form into a thick disk, and then cook it over a griddle. Not the answer you're looking for? Browse other questions tagged substitutions bread allergy wheat or ask your own question. What is a good substitute for oyster sauce (for someone with a shellfish allergy) that is also allergic to mushrooms?